This article is about the Cold War Italian Army Acqui Motorized Brigade. For the Italian Infantry Division, see 33rd Mountain Infantry Division Acqui. The Acqui Motorized Brigade was an infantry brigade of the Italian Army, based in the centre of the Italian peninsula. The Brigade was one of the oldest of the Italian Army and the name connected the brigade to its original area of recruitment around the city of Acqui. In 2003 the Acqui was raised as a division command and in 2013 the Acqui became a full division. After the ascension to the throne of Charles Albert of Sardinia on 27 April 1831 a major reform of the military of the Kingdom of Piedmont was undertaken. Thus on 25 October 1831 the Acqui Brigade was raised in Nice and consisted of the 1st Infantry Regiment and the 2nd Infantry Regiment. the 1st Infantry Regiment continued the traditions of the Desportes Regiment. 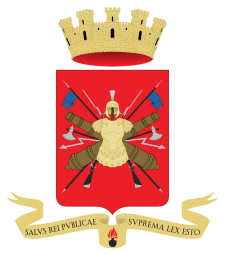 The Desportes had been founded on 27 October 1703 by Victor Amadeus II of Sardinia as a foreign volunteer regiment. By 1839 each regiment fielded four battalions, which in turn fielded 4 companies of 250 men each. In 1839 the regiments of the Acqui were numbered and renamed as 17th Infantry Regiment Aacqui and 18th Infantry Regiment Acqui. The brigade participated in the First Italian War of Independence fighting in the battles of Santa Lucia, Goito and Novara. For its conduct at Novara the 17th Infantry Regiment was awarded a Silver Medal of Military Valor. In 1855 the brigade provided two battalions for the Sardinian Expeditionary Corps in the Crimean War. In the Second Italian War of Independence the brigade was employed in the battles of Magenta and Solferino. For its service at Solferino the 17th Infantry Regiment was awarded its second Silver Medal of Military Valor. In the following years the brigade was employed in Calabria and the region of Salerno to suppress the popular revolt of the peasant population against the annexation of the Kingdom of the Two Sicilies into the new Kingdom of Italy. The brigade was based in Reggio Emilia, when it was in disbanded in 1871 during a reorganization of the Army; but by 2 January 1881 the Army returned to a brigade structure and the Acqui was raised anew with the same two regiments. At the outbreak of World War I the brigade was based around the city of Ascoli Piceno with its two regiments fielding three battalions each and each of the battalions consisting of four companies and a machine gun section. The brigade fought in the Battles of the Isonzo and in the Battle of Vittorio Veneto. On 15 October 1926 the brigade was disbanded with its regiments joining other brigades. General Antonio Gandin, commander of the Acqui Division. In 1939 the name Acqui was given to the newly formed 33rd Mountain Infantry Division. After the entry of Italy into the war on 20 June 1940 the division entered France in the area of Argentera. After the Italian invasion of Greece in October 1940 bogged down under stiff Greek resistance the Acqui division was dispatched to Albania in December 1940 to augment the Italian forces under pressure by the Greek counteroffensive. The division saw heavy combat near Himarë and Vuno when the Greek army managed to break through the Italian lines after the Battle of Himara. The division participated in the Italian Spring Offensive in 1941 and in marched into Greece following the German invasion of Greece. In May 1943 the division transferred for garrison duties to the Greek island of Cefalonia. After Italy's surrender to the Allies on 3 September 1943 the divisions commanding general Antonio Gandin was left without clear orders from his superiors. Therefore Gandin decided to let his soldiers vote on 13 September 1943 as to what to do to next. The troops voted overwhelmingly to fight their former allies the Germans, thus the Acqui became one of the very few Italian units to actively resist the Germans. The Germans therefore summarily executed over half of the divisions soldiers and all of its officers in revenge during the Massacre of the Acqui Division. 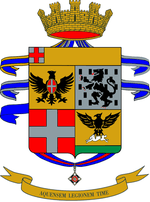 After World War II the 17th Infantry Regiment Acqui was raised again on 1 January 1948 as one of the three regiments of the Granatieri di Sardegna Division in Rome. The regiment was awarded a Silver Medal of Military Valor for the brigades service in the Greco-Italian War and a Gold Medal of Military Valor for its conduct on Cephalonia. On 1 October 1975 the Italian Army abolished the regimental level and battalions came under direct command of brigades. At the same time the army split the Granatieri di Sardegna Motorized Division into two brigades. Thus on 30 September 1975 the 17th Infantry Regiment Acqui was disbanded and on 1 October 1975 the Motorized Brigade Acqui raised in its stead. The brigade was based in the central Italy and had its headquarters in L'Aquila. When in 1991 after the end of the Cold War the Italian Army disbanded a large number of its mechanized brigades in Northern Italy, the Acquis infantry battalions received VCC-2 armoured personnel carriers, while the 48th Taro was equipped with M109 self-propelled howitzers. Accordingly the brigade changed its name on 1 October 1991 to Mechanized Brigade Acqui. At the same time the brigade lost the 57th Abruzzi and 9th M.O. Butera battalions, but gained the 123rd Infantry (Training) Battalion Chieti, in Chieti. During the same year the battalions were renamed as regiments for traditional reasons. Before the brigade was disbanded on 30 June 1996 the its units were either disbanded or joined other brigades: in 1995 the 17th Infantry (Training) Regiment Acqui and the 123rd Infantry (Training) Regiment Chieti joined the Army Training Command, the 130th Mechanized Infantry Battalion Perugia was disbanded on 30 May 1996 and the 48th Self-propelled Field Artillery Regiment Taro, which had been renamed 33rd Self-propelled Field Artillery Regiment Acqui on 11 September 1995, joined the Granatieri di Sardegna Mechanized Brigade on 15 May 1996. In 2002 the Italian Army raised three division commands, with one of the three always readily deployable for NATO missions. The army decided that each division should carry on the traditions of one of the divisions that served with distinction in World War II. Therefore on 31 December 2002 the 3rd Italian Division in San Giorgio a Cremano was renamed as Division Command Acqui. Together with the Friuli Division and the Tridentina Division the Acqui will come directly under the Armys Operational Center (Centro Operativo dell’Esercito or COE) once COMFOTER has been disbanded.